It’s been moving to receive messages from abuse survivors in response to my essays on Jesus’s condemnation of abuse and Aquinas’s love-based defense of opposing injustice. Thank you for writing. This week, my essay will be a bit longer as I dive deeper into this topic of loving our neighbors – enemies and the abused – as ourselves. I look at the ethics of resistance in Jesus’s teaching and practice. Thanks as always for stopping and thinking with me on these important, very practical topics! Thanks to our newest monthly supporter, Lindsay, and the 30 supporters who make this writing possible. Last week, I concluded my essay by asking if Jesus supported principled resistance to injustice. Can we embrace Aquinas’s logic without de-radicalizing or even reversing Jesus’s radical teaching about loving our enemies? Does Jesus give ground for resisting or even forcefully opposing the violence of a husband against his wife or a government against its citizens? In this essay, I want to look briefly at nineteen pieces of evidence. Mary sang before Jesus’s birth, “[God] has brought down rulers from their thrones, but he has lifted up the humble. He has filled the hungry with good things, but has sent the rich away empty” (Luke 1:52-53). Mary clearly believed that God was going to reverse injustice (“rulers”) and privilege (“the rich”) through her son Jesus, but the practical implications of her song are not spelled out. Jesus’s birth inspired the pagan Magi to disobey King Herod’s order, and they refused to reveal Jesus’s location to this murderous ruler (Matthew 2:8, 12, 16). However, their disobedience didn’t prevent or interrupt Herod’s violence against other children (2:16-18). Commentators have often pointed out that the reformer John the Baptist baptized soldiers and didn’t tell them to abandon their swords. When soldiers asked John, “What should we do?” he told them to do justice and not to abuse their power (Luke 3:14). That is, John critiqued the misuse of force but not force itself. Interestingly, Jesus called John the greatest man who ever lived (Matthew 11:11), and we don’t have any record of Jesus critiquing John for baptizing converted soldiers. Jesus launches his ministry directly after John “had been put in prison” for critiquing the abusive immorality of King Herod (Matthew 4:12; 14:1-12). Matthew records, “From that time on, Jesus began to preach, ‘Think totally differently, for the kingdom of heaven has come near’” (4:17; also Mark 1:14-15). Jesus doesn’t lead a campaign to free John or topple Herod. But Jesus’s ministry is launched as a subtle protest against Herod’s injustice: when John is silenced, Jesus raises his voice. In fact, Jesus provocatively makes the Public Enemy’s message his own – word for word (compare Matthew 3:1 and 4:17). Jesus declares in his first public teaching, “Blessed are those who are persecuted because of justice, for theirs is the kingdom of heaven” (Matthew 5:10). This is a veiled statement of protest: God favors the persecuted – not the persecutors. However, Jesus goes on to praise those who endure persecution like the prophets (5:11-12). He doesn’t say anything – for or against – trying to prevent persecution itself. Jesus makes the severe statement, “Do not give dogs what is sacred; do not throw your pearls to pigs. If you do, they may trample them under their feet, and turn and tear you to pieces” (Matthew 7:6). Jesus’s meaning is cryptic and unclear. But he appears to be encouraging wisdom and not unnecessarily exposing yourself to others’ abuse. Jesus introduces the principle of equality and concern for others as the heart of authentic ethics: “In everything, do to others what you would have them do to you” (Matthew 7:12; also 22:39-40). In context, Jesus is clearly encouraging practices of kindness and generosity toward others. But we’ve seen that Thomas Aquinas found additional applications of this principle. If I have lost my way and started destroying others, my better self would want others to stop me and prevent me from doing more damage to others and myself. Jesus’s master-principle can be applied in different ways, including as a justification for opposing injustice. When Jesus encounters a Roman military commander in rural Capernaum, Jesus is “amazed” by this man’s vision of authority (Matthew 8:10). Rather than telling him to quit his job, Jesus praises him and exalts his “faith” above religious insiders (8:10-13; 21:43). Jesus’s silence about this man’s military position is especially provocative, because Jesus’s fellow Jews would have certainly seen him as an unjust colonizer to be resisted. (Jesus had “Simon the Zealot” in his inner circle of disciples, but Simon was following Jesus as a student and not as a freedom fighter [Matthew 10:4].) So this passage can be interpreted in two divergent directions. First, it can be read as an acceptance of military vocations, which should enforce justice. Second, it can be read as an acceptance of – or at least nonresistance to – unjust political occupation. Jesus repeatedly casts out demons that oppress people as part of his ministry to liberate the “harassed and helpless” (Matthew 8:28-34; 9:32-34; 10:8; 17:14-18). In fact, the people see this liberating activity as proof of Jesus’s messianic kingship (Matthew 12:23). In other words, Jesus did not accept demon possession and its destructive effects as part of God’s will, a form of divine punishment, or something to be ignored or accepted. Jesus came “to set the prisoners free” (Luke 4:18), and he saw exorcism as a sign of God’s kingdom (Matthew 12:28). Now, if we can see injustice as connected to satanic oppression, then we can also see resisting injustice as a continuation of Jesus’s liberating ministry (see Matthew 13:40-43). However, Jesus himself doesn’t unpack this application of his exorcisms. Jesus famously said, “I did not come to bring peace but a sword” (Matthew 10:34). In context, Jesus is not justifying armed resistance but warning that his followers will be rejected or “cut off” by their friends and family for following him. Jesus is making the same point when he says, “The kingdom of God has been subjected to violence, and violent people have been raiding it” (Matthew 11:12). Jesus is talking about suffering persecution, not taking up arms to establish God’s kingdom. Jesus clearly states that the purpose of the law is to defend (not condemn) “the innocent” and to promote human flourishing (Matthew 11:7-12; 15:1-20). He says, “The more important matters of the law [are] are justice, mercy, and compassion” (Matthew 23:23). Jesus uses this vision of law to reject what he saw as oppressive religious policies. Jesus’s revisions were so radical that the Pharisees “plotted how they might kill Jesus” (11:14). Matthew writes that in this way, Jesus “proclaim[ed] justice to the nations” (Matthew 12:18). Jesus’s life-affirming vision of law is the source of the principle “an unjust law is no law at all.” Jesus himself doesn’t explicitly endorse justified resistance based on this principle, but his words have been interpreted in this way by many in the Christian tradition, including Augustine, Thomas Aquinas, and Martin Luther King, Jr. When a law is unjust or harms human life, it should be disobeyed as an act of obedience to God. Jesus clearly believed in God’s final judgment in which God will “separate the wicked from the just” (Matthew 13:49; 19:28). Jesus names “murder, adultery, sexual immorality, theft, false testimony, slander” as sins that “defile” people before God (Matthew 15:19). But Jesus also warns against trying to act as divine judges, which easily does more harm than good. This is an incredible scene. First, Jesus’s act is premeditated and intentional: he braids a whip to serve his purpose. Second, Jesus forcefully drives the businesspeople out of the Temple and blocks them from reentering. He overthrows their merchandize and scatters their money. Third, Jesus articulates his reason for doing this: God’s purpose for the Temple had been corrupted, and Jesus wanted it to stop. It seems Jesus may have had Gentile outsiders especially in his heart, because he cleared the area reserved for them which was crowded with merchandise (Mark 11:17). 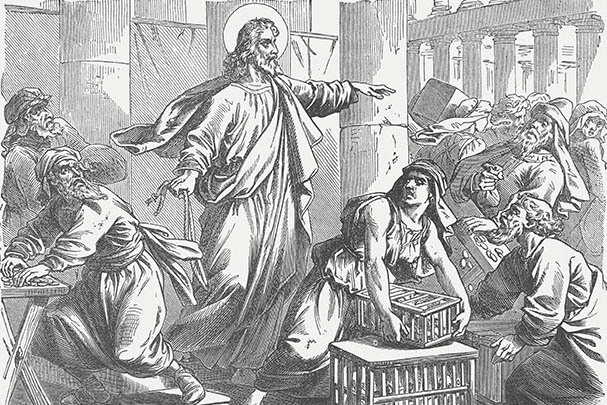 Jesus’s protest action becomes even more interesting when we recall that the Temple was built by Herod (begun in 20BC) and is known to this day as “Herod’s Temple.” What Jesus did was a forceful protest against political and religious power conspiring to corrupt God’s purpose. Unsurprisingly, the leaders wanted to kill Jesus for doing this (Mark 11:18). Of course, the crucial question is, “Can Jesus’s action serve as a precedent for his followers to forcefully intervene when God’s will is violated today?” This question is complicated. First, Jesus only makes this protest action in relation to the Temple; we don’t have examples of Jesus cracking whips against Roman soldiers abusing their subjects. Second, if we can take Jesus’s action as a precedent for us today, how do we know when and where to apply it? Paul writes, “Don’t you know that your body is a temple of the Holy Spirit?” (1 Corinthians 6:19). If a husband is abusing his wife or a government its citizens, is it right for them to “make a whip” to protect themselves, since abuse is clearly a violation of God’s will for humanity? Jesus didn’t hesitate to tell stories in which the violent are violently stopped. For example, in his Parable of the Wedding Banquet, Jesus talks about subjects who “seize,” “mistreat,” and “murder” their king’s servants. Jesus says, “The king was enraged. He sent his army and destroyed those murderers and burned their city” (Matthew 22:6-7). Of course, Jesus is telling a story – not prescribing policy. But it is relevant that Jesus tells a story that depends on the ethical logic that murderers should be stopped and not allowed to continue their violence. Rather than enlarging Caesar’s authority, Jesus is limiting it. “Give back to Caesar what is Caesar’s, and to God what is God’s,” then, could be interpreted as a powerful principle for justified resistance: if a political ruler abuses his subjects, he is abusing something that belongs to God and should be opposed as an act of obedience to God. But Jesus doesn’t spell this out. He leaves it provocatively coded. No wonder his listeners were “amazed” by his answer (22:22). Jesus looked critically at human rulers. He told his disciples not to see “the kings of the earth” as their parents (Matthew 17:25-27). Likewise, Jesus called Herod “that fox,” a sharp denunciation in Jewish culture where fox were seen as worthless, defiling predators (Luke 13:32). Jesus also fiercely and publicly critiqued religious leaders who practice hypocrisy, greed, self-indulgence, and oppression (Matthew 23:1-36). Jesus was not silent or “submissive.” Still, Jesus himself didn’t organize a campaign to depose these corrupt leaders. Aside from his Temple protest, he restricted himself to verbal attack. When Jesus was unjustly arrested, he wasn’t silent. Matthew says that Jesus declared to the high priest, “From now on you will see the Son of Man sitting at the right hand of the Mighty One and coming on the clouds of heaven” (Matthew 26:64). Jesus is using biblical metaphor to say that God will vindicate him despite their injustice. In John, an official slaps Jesus in the face for challenging the high priest, and Jesus retorts, “If I said something wrong, testify as to what is wrong. But if I spoke the truth, why did you strike me?” (John 18:23-24). Jesus confronted his persecutors with their injustice. But he didn’t violently resist them. Matthew tells us that the Roman “seal” that Pilate put over Jesus’s tomb was broken open when Jesus was resurrected (27:66; 28:2). What government violence tries to bury, God will raise up to new life. But astonishingly, the resurrected Jesus doesn’t say a word about his killers and makes no call for revenge. Instead, he sends his followers to “teach all nations to obey everything I have commanded you” (Matthew 28:20), which included Jesus’s condemnation of murder (5:21-22) and his call to love enemies (5:43-48). Stop and think with me. Does Jesus give ground for resisting or even forcefully opposing violent injustice? I think the evidence is provocatively open-ended and points in multiple directions. On the one hand, Jesus clearly favors the poor and oppressed. Jesus teaches powerful principles that defend the dignity of human life and accountability for injustice: “Treat others the way you want to be treated.” “Humans weren’t made for the Sabbath but the Sabbath for humans.” “Give to Caesar what belongs to Caesar, and to God what belongs to God.” Jesus doesn’t oppose military personnel. Jesus fiercely condemns abuse. Jesus boldly critiques injustice. Jesus himself makes a whip, enters the Temple, and forcefully clears it to defend God’s will. On the other hand, Jesus always seems to stop short of unpacking the provocative implications of his principles. Jesus doesn’t mobilize campaigns to overthrow injustice. With the exception of his Temple protest, he doesn’t engage in any violent action. Jesus doesn’t resist his arrest and execution. This is a vital and urgent question: Can followers of Jesus passionately love their neighbors as themselves and forcefully resist injustice with conviction? Rather than giving simplistic answers, Jesus’s preaching and practice require us to wrestle with this crucial question. More perspective is needed as we dwell in the tension of loving our neighbors – enemies and the abused – as ourselves.